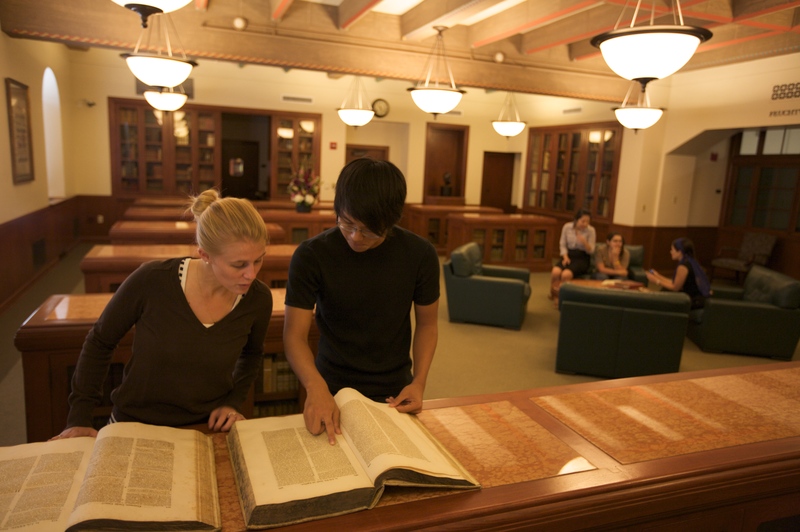 The Feuchtwanger Memorial Library is part of Special Collections. We are located on the second floor of Doheny Memorial Library on the USC Campus. The reference desk of Special Collections can be found in room DML 209. Content on this LibGuide was drawn from a variety of sources, including finding aids created by USC Libraries for the collections described. These finding aids are frequently the product of collaborative effort and revised over time. Marta Feuchtwanger willed her house and her husband's fine library to the University of Southern California. The house was sold to a German consortium interested in preserving this historic monument as a study center, and the proceeds were committed to create a suite of rooms as a permanent memorial to Lion Feuchtwanger, to his late widow Marta (1891-1987), and to his literary legacy. Today, the bookcases and cabinets in the Feuchtwanger Memorial Library which is located on the second floor of Doheny Library contain the most important books from the author’s collection, as well as Feuchtwanger’s own writings in various editions and translations. Another 20.000 books from Feuchtwanger’s library are still on long-term loan at his former house, Villa Aurora, which is now an artist residence and historic landmark. Besides Lion Feuchtwanger’s collection of rare books, the Feuchtwanger Memorial Library also houses his personal materials such as correspondences, manuscripts and photographs as well as archives on other German-speaking exiles such as Marta Feuchtwanger, Ludwig Marcuse, Hanns Eisler, Felix Guggenheim and Heinrich Mann. Researchers from around the world turn to the Feuchtwanger Memorial Library for their research on the German-speaking exiles in Southern California or other related subjects. The Feuchtwanger Memorial Library also offers research grants to those interested in working with the collections. Most texts for this LibGuide were taken from a pre-existing website for the Feuchtwanger Memorial Library which was created by Marje Schuetze-Coburn and other contributors. The Feuchtwanger Memorial Library was given to the University of Southern California by Marta Feuchtwanger, the widow of the German exile writer, Lion Feuchtwanger. In all, the Library contains nearly 30,000 volumes. Some 8,000 of the rarest books are housed on the USC campus, while 20,000 volumes remain on long-term loan at the Feuchtwanger's former residence, Villa Aurora, in Pacific Palisades. Lion Feuchtwanger (1884-1958) fled Europe during World War II and lived in Los Angeles from 1941 until his death in 1958. He began his literary career as a theater critic and turned his talent to writing plays in the 1910s and 1920s. He first became internationally known, however, for his historical novel Jud Süss published in 1925. During his seventeen years in Southern California, he wrote primarily historical fiction including: Waffen für Amerika also called Die Füchse im Weinberg (1947-48; Proud Destiny ), Goya oder Der arge Weg der Erkenntnis (1951; This is the Hour, a Novel about Goya ), Spanische Ballade also called Die Jüdin von Toledo (1955; Raquel, the Jewess of Toledo ), and Jefta und seine Tochter (1957; Jephta and his Daughter ). Feuchtwanger's library reflects his interests in different historical periods and contains several noteworthy smaller collections of primary and secondary sources focusing on such subjects as Greek and Latin classics, Jewish and biblical history, the Enlightenment, French Revolution, German literature, and exile literature. Authors collected by Lion Feuchtwanger included Cicero, Juvenal, Ovid, Sophocles, Thucydides, Virgil, Xenophon, among others. Feuchtwanger wrote a trilogy covering the life of Flavius Josephus, a Jewish historian of the first century: Der jüdische Krieg (1932; Josephus ), Die Söhne (1935; The Jew of Rome ) and Der Tag wird kommen (1942; The Day will Come , also called Josephus and the Emperor ). Feuchtwanger acquired a large collection of the various editions and translations of the works of Flavius Josephus spanning 400 years of printing. The earliest of these is a Florentine edition from 1493 in Italian. Chronologically follow seven 16th century imprints, including a 1544 Greek edition by Froben, the famous Swiss printer. Feuchtwanger's collection also contains two seventeenth century editions, five 18th century imprints, and one 19th century volume. As a lover of books who was interested in the history of printing, Feuchtwanger enjoyed collecting early printed books. One of his favorites was the Liber Chronicarum (the Nuremberg Chronicle ) written by Hartmann Schedel and printed in 1493 by Anton Koberger. In all, there are eighteen incunabula. Feuchtwanger's extensive collection of first editions and secondary works from this period include works by Voltaire, Rousseau, Diderot, Condorcet and Helvétius. Of special interest is the seventy-volume first edition of Voltaire's collected works edited by Beaumarchais and printed in Germany to circumvent French censors. Feuchtwanger wrote several novels set around the time of the French Revolution and collected material from this period to support his research. In addition to books, he acquired pamphlets, defences of, and attacks on, the Jacobins, and political caricatures. One of the most interesting items in this group is a copy of Le Moniteur Universel covering the years from 1792-1813. This newspaper, founded by the famous Parisian bookseller Panckoucke, was the official governmental news organ under Napoleon. The newspaper is a rich source for social and economic history, as it covers not only the political events of the time, but also discusses the arts, the stock market, food prices, and more. Feuchtwanger's copy of Le Moniteur belonged to Napoleon's only son, the Duke of Reichstadt. Not surprisingly, Feuchtwanger assembled an extensive collection of German first editions from the eighteenth century Sturm und Drang, and from the Romantic and Poetic Realism movements of the nineteenth century. Represented in first editions are Goethe, Grillparzer, Heine, Immermann, Jean-Paul, Klopstock, Lessing, Schiller, and Wieland. Since Feuchtwanger was a well known member of the exile community in Los Angeles and kept in contact with many of his fellow literary exiles, he was given numerous inscribed copies of first editions by such writers and personal friends as Alfred Döblin, Bruno Frank, Oskar Maria Graf, Heinrich Mann, Thomas Mann, Ludwig Marcuse, Franz Werfel, and Arnold Zweig. There is as well manuscript material by some of these individuals. The library contains a virtually complete collection of Feuchtwanger's own works in their numerous editions and translations. During his long career as a writer, Feuchtwanger wrote 19 plays, 19 novels, and numerous short stories and essays. Feuchtwanger's works have been, and continue to be, published in many countries, and his works have been translated into more than thirty languages.